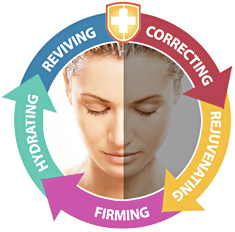 By combining science with nature, we have made a revolutionary breakthrough in the war against the signs of aging. While some anti-aging treatments focus on chemical exfoliation to accelerate cellular turn-over, Amino Peptide Serum goes deeper, focusing at the dermal matrix. Delivers a combination of wheat and other non-animal derived amino acids linked together to form a penta-peptide and hexa-peptide, combined with light squalane (olive derived) for an elegant feeling moisturizer that visibly reduces deep wrinkles and skin roughness for overall improved skin. Novel patented GC-100 Peptide which clinically proven to reduce the appearance of .fine lines and wrinkles up to 57%, this skin balancing Serum delivers essential moisture to the skin's surface. Especially formulated with anti-oxidants and free radical scavengers that work to repair and prevent cellular damage. Decreasing pore size, wrinkles, acne, and the appearances of irregular skin blemishes. No cytotoxicity, No product sensitivity, No side effects! Stimulate the natural production of Collagen I, III and IV, Fibronection. iLAB’s original peptide mask system for skincare professionals and doctors. This anti-aging mask system is easy to use and takes only 20 minutes a day 2 times a week, but the results are visible after the very first application. Each mask application will minimizes the appearance of large pores and encourages skin to repair itself. It promotes cell regeneration process, allows fresh young cells to surface and leaves your face looking smooth and fresh. Peptide Masks also leave your skin healthier by stimulating blood circulation to the tissues. Thus they help the skin flush itself clean of impurities and toxins. As a result, your skin gets that healthy youthful glow. Apply with spatula to face and neck in an upward motion, avoiding eye area. Remove mask after fifteen minutes with plenty of tepid water. Do not try to scrape or peel off mask.